Vanello (by his real name, Razvan-Dumitru Voicu) is a producer and composer from Romania. 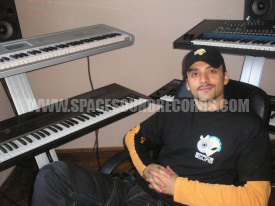 He started working with electronic sounds in 1994 (at the age of 14) and his first album in Electronica genre, "Sidereal", was unofficially releases in 2000. He also made music for tv documentaries, radio jingles and remixes for different artists covering styles from Electronica to Trance, Electro or Ambience. Hello, Spacesound! Hello, dear spacesynthers from all over the world! Well, I am 28 years old, I live in Bucharest, Romania, a big and crowded city like other European capitals, I studied in Bucharest, I have a journalism degree and I work as a Production Executive in one of the top radio stations from Romania, Radio Pro FM. Well, I remember when I was a kid I used to drum in all kind of objects that could make rhythm. In 1994, at the age of 14, I bought my first keyboard, which was the small Casio SA-20 and begin to play electronic sounds, make funny little songs and enjoy my folks... I always was an auto-addict, although I have musicians in my family... a few years later, I naturally bought a bigger keyboard and soon more serious ideas came out... but the first real step was in 2000, when I unofficially released my first Electronica album, "Sidereal", using only one keyboard and the computer. That was a successful album but made in limited technical conditions. From 2000 to 2006 I've composed 6 albums in Electronica style but none of them was released because I didn't think there were completed (and I still think that now but who knows what tomorrow might bring)? Beside my Electronica project, I also made some music for TV documentaries, a lot of radio jingles and promos and different remixes from Dance, Trance to Electro or Ambient style. From 2007 I began to work at my first spacesynth album, "Planet Synth", which hopefully will be released until the end of this year. I like all the things related to space: music, SF books, movies, documentaries, magazines, I guess I am a space maniac. Except that, I like being in the middle of nature, it always inspires me, I like radio, football, and I like spending time with my girlfriend. Working in a radio station made me listen to all kind of music... but mostly I like 80 synthesizer music (Italo, Dance, Electro, Pop), movies music, ambient music, trance, electro and pop music. In the late ' 80, there were a lot of spacesynth songs playing on the national radio station along with other famous synthesizer themes from Jarre, Vangelis, Kraftwerk. It was then when I discovered Koto and LD songs, although I didn't know the names of the artists neither that this genre was called spacesynth. Well, when you make electronic music and you love the magic sound of 80's synthesizers and all those spacey stuff, it's impossible not to try to compose space synth too. For me, this is more simple music than what I use to do in my Electronica project but the satisfaction while working at the songs is maybe greater. It's actually another side of me as a composer, a more energetic and jovial one. Working on "Planet Synth" album made me many times enthusiastic and that's really motivating for an artist. Well, to be honest, for the first time I didn't liked those storyteller voices from songs like "Dragon's Legend" for example, but now I got used to it. What I still do not like that much is the monotony of some songs, repeating the same themes over and over and this is something I try to avoid in my own songs. In spacesynth music my influences were Koto, LD, Hypnosis and italo dance music. Generally speaking, there a lot of influences from artists like Jarre, Vangelis, Kraftwerk, Kitaro, Enigma, Space, Mike Oldfield, Depeche Mode, Erasure, Ennio Morricone and many others. I always considered Jean Michel Jarre my favourite artist. His music, especially his earlier albums are just great, I listen to them often and I am still amazed. For me, JMJ is a complex artist that I always wish to have as example. I learned from him many things from the passion within he plays his instruments in live shows to his courage of experimenting and surprising each time the audience. Of course, he's not the only one but he's still my number one artist. The first spacesynth album I heard had a big impact on me. That was Koto - "From the Dawn of Time", I still think is the best one. It seems to me more mature than Michiel previous albums and it's got that killing koto bass I just love it. I do not have any preferences, any artist that appreciates my music and wants to collaborate with me in a way or another can contact me. Oh, yeah... italo is great... dance music of the 80' is great... I use to listen in my car and I always get into the good mood. Silent Circle, Fancy, Joy, Sillicon Dream, Max Him, Eddie Huntington, Grant Miller etc. still burn the 80' floor. I'm afraid I am not so familiar with the Demo scene, I recently found out about it. My music is between classic spacesynth and italodance so I guess I'm more into Marco's side. I remember when creating the "NS2" project, my intention was to take classic spacesynth forward and mix it with trance and electro. While I was working at the songs for the album, I discovered that I was getting more into classic feeling of 80's so I decided to stay there because this is what I feel and this is what I like to do now. Recreating the magic of '80 in my own way, as I feel it today. I like using in my spacesynth songs 80' kicks, 80' stabs, 80' synths, 80 ' basslines etc. That doesn't necessary mean that we should always try to recreate sounds LD and Koto use, but I think there is a certain reason those artists use those sounds... are incredibly good, so making spacesynth by using only modern synths sounds just doesn't fit so well, the magic is gone, and spacesynth has something magic that must be kept. But everybody is free to try any combination and move forward as long as melody remains. Experimenting is always good as long as the results are too. This is hard but I think this genre has a certain audience which can grow if more labels will release spacesynth (synthesizer dance) albums and they will try to promote this style on events, parties, radio stations, even makings some professional videos. I observed nobody made until now a good video for a space song, there were a few tentative efforts but nothing really serious. Images have always such a big impact and can give much more power to a song. My belief is that audience can be educated, I see there are a lot of electronic music sub styles like electro, minimal, progressive (instrumental music, mainly) which 10 years ago were considered as being underground in many countries from Europe and now there are parts of our life ( you can hear them on the radios, in the clubs, basically everywhere). So, maybe spacesynth could be reconsidered too if DJ's , people from labels and all of us will involve more into this area. I currently arranging my home studio in which I use synthesizers like Korg Triton Pro, Korg MS-2000, Roland JX-10, Roland D-50, Korg 03R W, Korg Polysix, Korg Wavestation and others, many samples, an Intel Core 2 PC with an RME FireFace 800 audio interface, Event TR monitors, Fruity Loops Studio, Cubase , Sound Forge and Wave Lab with a bunch of FX plugins. The vocal parts recording and the final mixing are made in a different studio using an Neumann U 89 microphone, Genelek 1019 A monitors, Crest Century mixing console and a PC with a Echo Layla audio interface. Definitely hardware... I use hardware synthesizers sounds in more than 90% of my music, I know there are some good VSTI today like Korg Legacy, Atmosphere, Stylus or Trilogy from Spectrasonics and others but still I think there are some differences in sound quality between hard synths and soft ones. I would like to thank to all spacesynthers for having the patience to read this interview and I'd like to tell them that making music is not an easy thing, artists are often making sacrifices by giving up to other things and working maybe years for an album so fans support is essential, without you guys we would listen our songs only in our bedrooms, so if you like the music, buy it and support us, even praise us, we do it for you because the real artist's purpose is to make the other people feel emotions and maybe change them into better persons. 5. Books or Cinema? Both. 7. Summer or Winter? Spring. 8. Cat or Dog? Doggies. 9. Beer, wine or Spirits? Cold beer. 10. Blonde or Brunette ? Beauty has no particular colour. Thank you too and good luck with your label, you're doing a great job and many many releases from now on!! !